This is a post about ideas and the railway. I mentioned, earlier, that I’d found a book that looked interesting. Well, I ordered it and I’ve been reading bits of it all this week. I was delighted to find this and it has turned out to be most interesting. It will be really useful for work at CSM. Let me explain. This is the learning that will give students the words and concepts that allow them to speak convincingly about their own work, and to comment legitimately about the work of others. The conversation begins about food, cars or shoes, and turns to design. Eventually and because we are a University, the conversation is expressed through writing. I take the view that; if you can speak, you can write. It’s just a question of understanding the systems and structures of academic presentation. In fact, all academic writing is a form of conversation. It’s a conversation that is international and that has been running for many years. Each book is positioned, as part of this conversation, in relation to previous publications (history), and as a contribution to the development of the conversation’s main themes (ideas). Understanding the historical interaction of ideas and interpretation is a key skill in making sense of the world. Being able to speak convincingly about all this is crucial to professional life; otherwise, it’s just colouring-in! In the old days, graphic design was understood as a print-based activity of commercial art. Nowadays, it is digital. But digital has changed too – it is now dynamic (potable), continuous (always on) and interactive (changes as you move through it). That’s producing a new kind of spectacular environment. We can call this The Matrix (watch the films). Architecture and engineering, communication and products; each progressively shape and define us through this experiential environment. 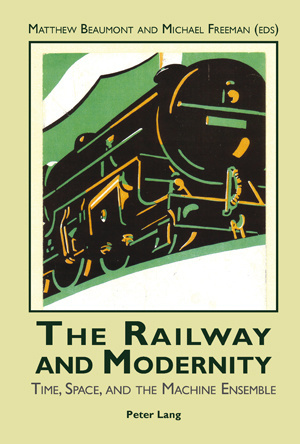 The railway provides an interesting historical precedent to this kind of system integration. And it has lots of lovely architecture, engines and posters and publications to describe. Perfect! The term Machine Ensemble describes the interaction of mechanical systems, machinery and people. these ideas as levers of power. machinery and organised so as to maximise efficiency. The Block Mill was designed by Samuel Bentham (administrator), Marc Brunel (engineer) and Henry Maudsley (machine tool designer). Just search for “machine,” if you want more. Anyway, the point is that the mechanical standardisations of early 19C Britain produce both products and people. Te worker, the consumer, the voter and the passenger all become consistent performers within the machine ensemble. Of course, I don’t mean that it lieterally kills us. It kills some of us when things go wrong and accidents occur. But generally, the mechanical forces of society are of greatly reduced violence. The brutality of the system is in the promotion of conventional thinking as consistent, efficient and productive. It’s convenient and comfortable (like the train) but the consequences are huge. Occasionally, we must go off the rails!